Our partnership with Whole Foods Market continues to be awesome! 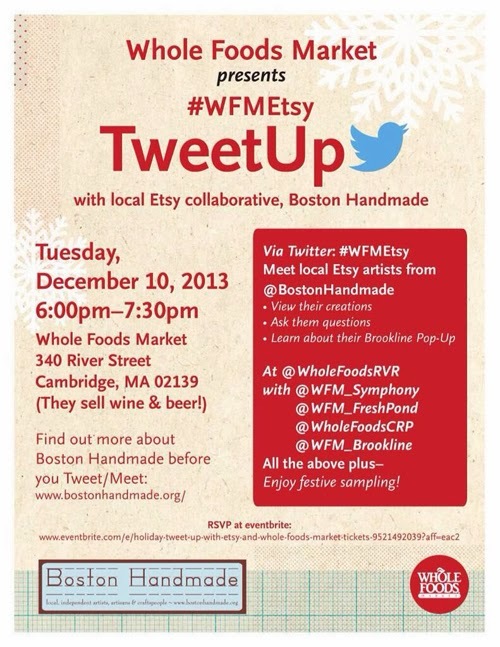 Join us TOMORROW, Tuesday, December 10th, from 6-7:30pm for a Twitter chat (aka: TweetUp) featuring members of Boston Handmade and exhibitors from our 2013 Boston Handmade Holiday Gallery. We'll be talking about our creative work, the gallery, offering some ideas for fun holiday craft projects, and answering questions about easy ways to DIY the holidays. There will also be refreshments and treats provided by Whole Foods catering (woo hoo!) and we will have examples of our work for everyone to see! The event will take place at Whole Foods Market River Street located at 340 River Street, Cambridge, MA 02139 and if you'd like to join in the fun register for free HERE using Eventbrite. Hope to see you tomorrow!